Although this updated fairytale lacks memorable musical numbers, the lively characters and fun story make 'Tangled' and perfect addition to the Disney cannon. Made for fans of fun Disney family films. Once upon a time a perfect drop of sunlight fell to the earth. From where it landed sprang a beautiful flower with magical powers. Whenever one would sing to it, it would cure or heal them from any ailment – including age. But an angry old lady named Mother Gothel discovered it’s powers and covered it up so nobody could ever take it from her. For her, this magical sunflower was her own private fountain of youth. At the same time, the king and queen of the local kingdom were about to have their first baby. Just before going into the labor, the queen became very ill. In a desperate attempt to save the unborn child and queen’s lives, the king sent out all of his men to find the flower. A mistake made by Gothel made it possible for the soldiers to find and retrieve the flower, allowing the queen to be healed and give birth to a beautiful baby girl, Rapunzel. Having been born with the power of the sunflower in her body, Rapunzel possessed a magical power of her own – whenever she sang or was sang to, her hair would glow and give off the same healing energy as the flower. This made the already-angry Gothel even angrier, so late one night she broke into the castle and took the baby. Since then, almost 18 years ago, she has been raising Rapunzel on her own, keeping her and her magical secret locked away high up in a hidden tower. It isn’t until a strikingly handsome and savvy thief, Flynn Ryder, stumbles across the tower that Rapunzel meets someone from the outside world – someone who can save her from the lonely isolation of the tower and be her guide to the outside world. The voice cast for Tangled is phenomenal. Musician and actress Mandy Moore (A Walk to Remember) perfectly leads the film as the naive and feisty long-haired princess. Zachary Levi (TV’s Chuck) adds a fun male presence to the film thats comparable to James Marsden’s in Enchanted. Also included in the cast are Donna Murphy (Spider-man 2) as Mother Gothel, Ron Pearlman (Hellboy), M.C. Gainey (LOST), Jeffrey Tambor (Arrested Development) and Brad Garrett (Everybody Love Raymond). 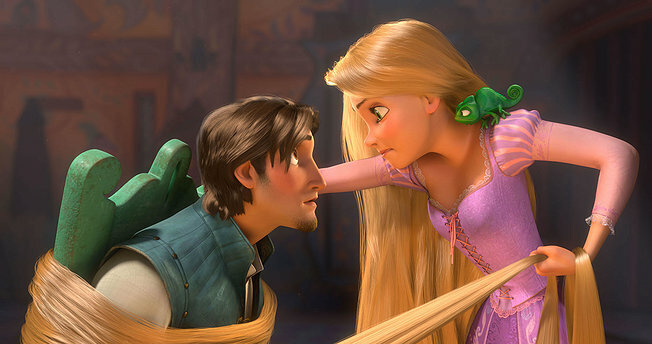 While the musical numbers may not be memorable and the quality of the CG may not be up to par with Pixar, the story and characters make Tangled a more than worthy movie to see this holiday weekend. It offers plenty of fun and laughs for the whole family, boys and girls alike.